Plants may help clean up our emissions, but their response is complicated. Buds on a cedar tree. One of the dumber but more-persistent climate change memes is based around the claim that CO2 is plant food. Plants rely on it for photosynthesis, so increasing its level in the atmosphere should benefit plants by boosting their growth. There are variants on this that claim plants are currently starved for carbon dioxide, while others suggest plants will grow so fast that they’ll keep the carbon from warming the atmosphere much at all. Fortunately, if you search the Web for “carbon dioxide is plant food,” all of the early hits you get are from people and organizations debunking the idea. While CO2 can help plants and may have contributed to a general greening of the Earth, it’s just one of a number of factors that influence plant growth. And a new study shows that, even when trees are clearly benefitting from the rising levels of atmospheric carbon, they don’t seem to be growing any faster. Carbon dioxide is incorporated into sugars through the action of a rather inefficient enzyme, so simply having more of it around makes photosynthesis run smoothly. When there’s more around, the pores that allow it into leaves can also close up a bit more, which conserves water. For these reasons, carbon dioxide has a fertilizing effect on many plants. But carbon dioxide almost never sets a limit on plant growth. Nutrients like nitrogen and phosphorus are more likely to be limiting, and it’s hard for plants to use water more efficiency when there isn’t enough water around. The elevated temperatures driven by all the CO2 we’ve put in the atmosphere can also impact plant growth, either directly through elevated temperatures or indirectly by enhancing droughts. So the precise impact of elevated carbon dioxide depends on a variety of local factors. Many of these have been tested in experiments that involve pumping extra carbon dioxide into the environment near the plants. These experiments tend to be relatively short term, often tracking the effects over a single growing season. A Canadian research team decided to track the impact of changing carbon levels over a much longer term. 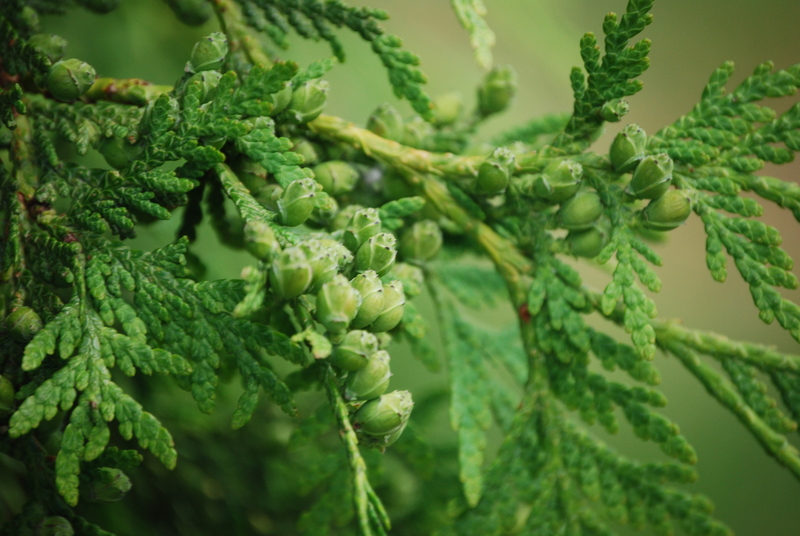 So the researchers found a population of white cedars in eastern Canada that allowed them to track over 700 years of the trees’ history. A core through the tree provides an indication of how well it was growing through the annual growth rings. But in this case, the core also provided a record of the growth conditions and water-use efficiency of the tree, calculated from isotopes of oxygen and carbon. The history showed things held steady up until around 1850, at which point atmospheric carbon levels began to rise. During this period, which is relatively wet and cool in the climate record, the trees responded to the elevated carbon levels by incorporating more carbon. From 1965 onwards, however, as the area dried out and warmed up, water use started to change in a way that would allow the trees to handle droughts more effectively. At no point did the trees show an enhanced growth, based on the tree rings. There are at least three periods in the record when the trees were growing at least as well as they have in recent years. While it’s possible that there was higher growth that isn’t reflected in the trunk, it’s clear that the rising levels of CO2 didn’t have a general fertilizing effect on these trees. What’s going on with the trees isn’t exactly clear. The change could simply be a response to carbon incorporation reaching a point where it’s saturated, allowing an additional focus on conserving water. Alternately, the environmental change to a warmer, drier environment may have driven the shift. As for why neither strategy seems to lead to growth, the researchers point to a study of trees elsewhere in Canada that indicates phosphorus was growth-limiting. The one thing that is clear is that the situation is complex. The trees showed at least two distinct responses to elevated atmospheric carbon or a possible response to water-availability changes. And there’s the additional possibility of a nutrient limiting growth. All of this is for a single species in a single geographic area. That complexity tells us that predicting how plants will respond to our ongoing experiment with the atmosphere will require a lot of work to sort out. And, at the pace our carbon emissions have increased, it’s possible that the response of plants will continue to change even as we’re studying them. PNAS, 2019. DOI: 10.1073/pnas.1816686116 (About DOIs).